Brittany Clemons has contributed to documentary television as an associate producer for the past six years. The majority of her work has been featured on PBS, including Henry Louis Gates, Jr.'s Emmy, Peabody and duPont-Columbia Award-winning six-part series The African Americans: Many Rivers to Cross, and two seasons of the celebrity genealogy series Finding Your Roots. She has most recently served as the senior associate producer on NBC’s two-hour documentary special Hope & Fury: MLK, the Movement, and the Media, and is currently a story producer on an upcoming hip-hop documentary series for AMC. Brittany is passionate about diversity and representation in front and behind the camera, as well as creating compelling narratives with nuanced characters that amplify the marginalized voices of women and people of color. Shannon Jones is currently a Producer with HealthiNation, where she creates editorial and branded video content. She is part of all levels of production and post-production including: research, writing scripts, directing on set, camera operating, and art direction. Shannon was nominated in 2017 for a Daytime Emmy for her work with the producing team for the short film "Time To Live Again." In addition to documentary projects, Shannon has also produced narrative short films including buddy comedy "Mila and Mimi Too" which become part of The Spy Who Dumped Me marketing campaign, and sci-fi drama "OVUM" which considers a woman's right to choose in a dark future. Shannon received her BA in Business Journalism, Media & Communications from Baruch College and completed an Advanced Cinematography Intensive from the School of Visual Arts. Lauren Vernea is a Chicago native and graduate of the MS in Leadership for Creative Enterprises program at Northwestern University. Currently based in New York City, Lauren is a writer, actor, and documentary producer. Her work as a documentary producer and researcher includes Explained (Vox/Netflix), the hip-hop documentary series The Field (Mass Appeal/Starz), OJ Simpson: The Lost Confession (FOX), NOVA Wonders (PBS), and Finding Your Roots (PBS). As a writer, Lauren studied TV Writing at New York City's Gotham Writers Workshop. Her work consists of writing and starring in her Youtube digital series Art is Charisma, which explores the life of a frustrated Chicago singer, Open TV’s Black Melodies, a docu-series which follows the journeys of Chicago's young, black and gifted musicians, and #TheResistance, an In Living Color style sketch comedy show that fights the power in the age of Trump. Lauren is a professional singer/actress who has trained at The Stella Adler Studio NY and The Atlantic Acting School. Shooting out of an open cable car in the Swiss Alps at 9000 feet; getting followed by Pakistani intelligence officials in Kashmir; smuggling a camera into the holiest Muslim site in the world; narrowly avoiding terrorists near the Afghan border; these are the many things that Nausheen Dadabhoy has done to “get the shot.” Before she was a nomadic cinematographer, Nausheen was a Southern California native who received her MFA in Cinematography from the American Film Institute. Since graduating she has lensed a number of narrative and documentary films: most recently J'adore Nawal for Lena Dunham's HBO documentary series Lenny which premiered at Sundance, Academy Award Live Action Short nominee La femme et le TGV (The Railroad Lady), and Aaja a music video for Riz Ahmed's hip hop group The Swet Shop Boys. Nausheen's films have played in competition at festivals like TIFF, AFI Fest, Locarno and IDFA. Her clients include Field of Vision, HBO, A&E and MSNBC. Kasia Kruk hails from Poland and is a New York-based crowdfunding strategist, social media manager, and film producer. As a producer, she worked on a stop-motion short film The HALLOWEEN PRANKSTA with Mark Hamill and award-winning films, such as NOTHING ABOUT CHLOE and GOOD BOY. Kasia has always been passionate about and dedicated to making the social impact with story-telling. 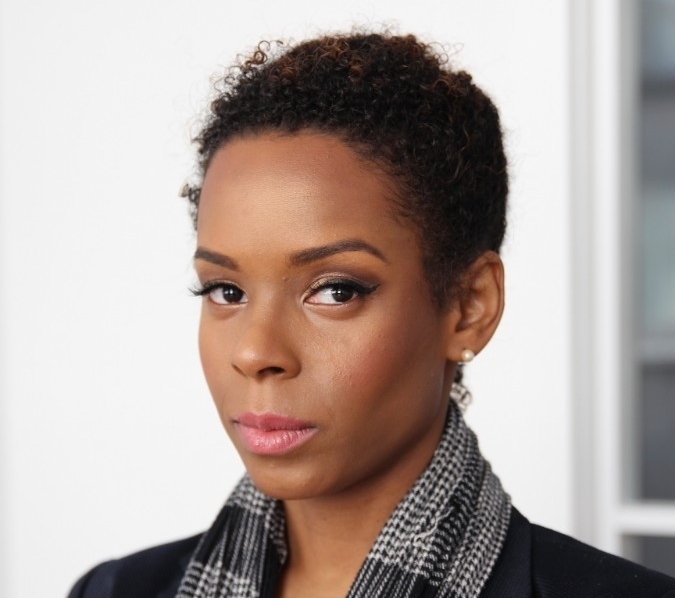 Kezia Bernard-Nau, a Trinidad native is an actor, writer & producer. She spent her formative years in Trinidad, moving to Brooklyn at the age of eight. Kezia continually uses her black and Caribbean roots to inform and drive her work as a performer. She is currently writing a series that discusses the hardships of gentrification in black neighborhoods and is also producing a short that deals with the necessary conversation of race. Kezia is happy to be joining the Blight social media team. Tiffany Lewis, a Caribbean native by way of Jamaica, West Indies, is a aspiring Television Production Associate; Entrepreneur, On-air Personality, Actor and Model. She attained a BA from Brooklyn College, where she majored in Sociology and minored in Music. However, her passion, despite her academic journey has always been in theater, production and media, which she has explored for several years. She is currently working on a six-part AMC hip hop documentary series and dabbling in a few other projects. Ultimately, she loves the idea of shared growth and has been fortunate enough to do so with phenomenal people as she expressed. She’s looking forward to what's next and excited to be a part of the BLIGHT crew.